Definition at line 40 of file lldrawpoolsky.h. Definition at line 47 of file lldrawpoolsky.h. Definition at line 51 of file lldrawpoolsky.cpp. Definition at line 70 of file lldrawpoolsky.h. Definition at line 53 of file lldrawpoolsky.h. Definition at line 56 of file lldrawpoolsky.cpp. Definition at line 61 of file lldrawpoolsky.cpp. Definition at line 66 of file lldrawpoolsky.cpp. References LLPipeline::disableLights(), LLVOSky::FACE_BLOOM, LLVOSky::FACE_MOON, LLVOSky::FACE_SUN, gAgent, gCamera, LLCoordFrame::getOrigin(), LLAgent::getRegion(), LLViewerRegion::getWaterHeight(), glPopMatrix, glTranslatef, gPipeline, gSky, i, LLVOSky::isSameFace(), llmin(), LLFacePool::mDrawFace, LLVector3::mV, LLSky::mVOSkyp, NULL, renderHeavenlyBody(), renderSkyCubeFace(), renderSunHalo(), S32, and VZ. Definition at line 203 of file lldrawpoolsky.cpp. Definition at line 172 of file lldrawpoolsky.cpp. References LLImageGL::bind(), face, mHB, and LLDrawPool::mIndicesDrawn. Definition at line 149 of file lldrawpoolsky.cpp. References LLSkyTex::bindTexture(), LLSkyTex::doInterpolate(), face, LLVOSky::FACE_SIDE0, FALSE, LLSkyTex::getInterpVal(), glColor4f, LLFacePool::mDrawFace, LLDrawPool::mIndicesDrawn, mSkyTex, and TRUE. 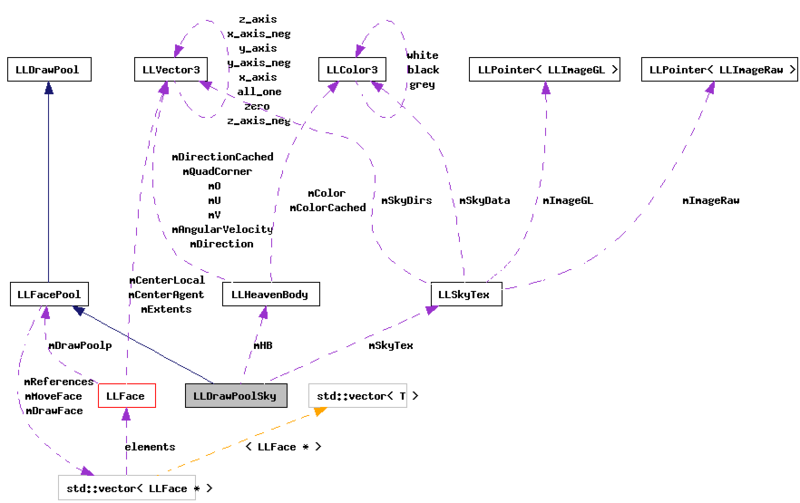 Definition at line 187 of file lldrawpoolsky.cpp. References LLImageGL::bind(), f, face, llclamp(), mHB, LLDrawPool::mIndicesDrawn, and LLColor4::mV. Definition at line 64 of file lldrawpoolsky.h. Definition at line 62 of file lldrawpoolsky.h. Definition at line 63 of file lldrawpoolsky.h. Definition at line 44 of file lldrawpoolsky.h. Referenced by renderHeavenlyBody(), renderSunHalo(), setMoon(), and setSun(). Definition at line 43 of file lldrawpoolsky.h. Referenced by renderSkyCubeFace(), and setSkyTex().